We will start the month of August with a great example of a ‘miniature’ orchid that can grow into a specimen. Plants flower well as tiny plants in 3cm pots or mounted but if left for long enough (the plant shown has been growing in its current basket for ten years) forms a ball that is covered in its delicate sprays of pink and yellow flowers. 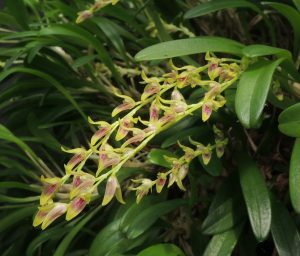 This species of Pleurothallis is native to the cloud forests of Colombia and Ecuador. 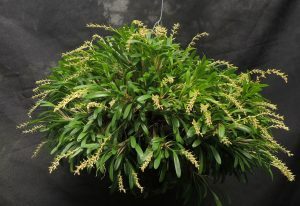 It is another from the Specklinia section and is a small growing species that produces masses of flower in the summer but can produce the odd spike at any time in addition. We find it grows well mounted or in pots and baskets. We grow the species in Cool Americas with lots of water especially in the summer when it is in most active growth. Great excitement here. Edward and I have one of these cute little orchids on our window sill! It is in a tiny pot placed in a little coffee cup. How much is “Lots of water” and how often should we water? I don’t think we have been watering our little plant enough. Growing my plants on a windowsill I water every two or three days to keep plants damp but not drowning. Though if you are going away for a holiday it wouldn’t hurt to leave this species sitting in a tray of water. Thank you. We definitely have not been watering our plant enough. Ps Rain Beautiful Rain is. beautiful song!